Charting ways of doing green politics differently. Lasting just seven years (1980-87) the Green Collective will be remembered not just for its many achievements, but also for being a bit different... It was ‘doing politics’ but not in a way you’d recognise as such. It didn’t fit into any of the usual categories, and it was a lot more than just a group of friends organising a festival. It was strongly political yet not a party. It handled large amounts of money yet was not a company. It made music but it wasn't just about entertainment. Its meetings would last a whole weekend and were far from process driven. It set out to ‘do good’ in the world yet wasn't a charity. It had a new kind of structure. It was an anarcho-political business hybrid, and it was fun! Perhaps the best comparison is a mix-up of different music genres. This was fusion politics. There was room, within the collective, for members to explore their own different passions and skills. The spirit was one of empowerment and change, exploring the new. The idea of being a 'collective' was inspired by Spanish anarchists in the 1930s. They controlled large areas in Catalonia and dispossessed the landlords. They organised themselves into collectives and turned the usual rules of political organising on their heads. The Green Collective had no leaders, no rules as such, and a free- flowing ethos. We actively encouraged people to step forward and take responsibility; and within the framework of the green gatherings, and other activities, there was something that everyone could do. Play was considered vital. It was even once considered as a possible principle of green politics, and seriously debated as such! Although the collective organised the green gatherings, it's also true to say the collective grew out of the gatherings, and the counter-cultural free festival foolery that was an intrinsic part of them. To understand all this, the best place to start is perhaps Richard Neville's book, ‘Playpower’. For the collective there was always merriment, entertainment with the 'house' band, Planet Waves, the RifRaff poets and others. The playful nature of the collective is perhaps best captured in its 'daft constitution', for some an irreverent response to the 'constitutionalitis' that was prevalent in Ecology Party circles at the time. Many members of the collective were also active in the party. One way to understand the collective is simply by looking at the range of different things it organised; the Glastonbury Green Gatherings themselves (outdoor festival-style camps), local green gatherings and fairs around the country, the Green Roadshow, the Green Fields area at the Glastonbury Festival and the occupation of a Cruise missile base at USAF Molesworth. Then there was the Green Collective mailing, the adoption of the sunflower as the symbol of green politics in the UK, and the creation of a small trading business - Sunflowers - to promote that. The collective also set up Green Promotions for music gigs, local independent green groups outside any political party structure and the Green Network Gathering. There was also a Land Fund for the eventual purchase of a permanent site for the gatherings. This was politics done in a different way. It's important to understand the history, to know how the collective came into being. The first gathering, in 1980, took place at Worthy Farm, site of today’s massive Glastonbury Festivals. The gathering was hatched at the Ecology Party conference in Manchester that spring, by a small group of members meeting during the lunch break, after the conference as a whole had decided not to replace its Spring Policy Conference with an outdoor Summer Gathering. Under the party's constitution at the time, members were free to brand their event 'Ecology Party', even though conference had voted against it.. So the first two gatherings were called Ecology Party Summer Gatherings. That anarchic spirit was there from the very beginning. Doing politics differently was a signature motif of the Ecology Party at its foundation. Back in 1972 when Movement for Survival and the PEOPLE movement (the direct predecessors of the Ecology Party) were created they were initially intended more as 'movements' than as 'parties', although both had a clear intention to contest elections. PEOPLE opposed having a single leader, accepted civil disobedience, encouraged independent candidates (seen as a purer form of democracy), and favoured locally autonomous groups over a top-down structure. They also wanted to work through other parties as well as fielding candidates of their own. They understood the critical need to build a political movement, to get environmental and allied groups to work together, as an essential precondition for success. To that end PEOPLE's founders invested at least 50% of their time in building a coalition of the wider green movement, particularly through the proposed Jigsaw Conference. But by 1979, on the back of a breakthrough General Election campaign, the mainstream Ecology Party had abandoned coalition building and was pursuing a more purely party political, electoralist and 'vanguardist' (in the dictionary rather than the Marxist sense) approach to change. They believed the wider movement should, and would, support a 'leading' Ecology Party, without the party needing to pro-actively engage with the wider movement. It was the Green Collective that then picked up the 'movement building' project abandoned by the party. It became the main purpose of the collective, and the one thing that united its many different projects. firstly the importance of working within a culture of change, with music and art that energised and supported the politics. secondly, by promoting the understanding that 'the personal is political', that we have to change ourselves as well as the outside world, that the two cannot be separated. The first was easy. The 60s and 70s had seen a counter-cultural revolution that had sown the seeds for this new 80s Green generation. The 1967 'summer of love' and the 1968, 'year of revolution' had inspired millions. "London, Paris and Berlin -we shall fight and we shall win" were chanted in the cities of Europe, and in 1980 that spirit was still strong. In the sixties and seventies, the psychedelic revolution, with a strong ecological ‘Get back to the Garden’ theme, was emerging in places like the UFO club and the ‘Granny Takes a Trip’ shop. Magazines like Oz and International Times, and the more spiritually orientated Gandalf's Garden, had huge readerships. Nascent alternative parties like the Freaks United Party in the UK, the Yippies in the US and the Gnomes (Kaboteurs) of Amsterdam were challenging what it meant to be political. This marriage, of the political with the cultural, was fundamental to 'building a movement' which had both depth and breadth. To make change happen people needed to feel it, as well as think it. They wanted to be inspired and touched, a movement of heart as well as head. In the eighties, as both the US and the UK lurched to the right, with Reagan replacing Carter (arguably the most eco-president ever), and Thatcher leading the charge towards neo-liberalism, it was the Green Collective that picked up the counter-cultural baton. The collective's own band, Planet Waves, attended our meetings and gatherings. They were the soundtrack for the Collective. There was also an understanding that a movement needs symbols of its togetherness. For that, the collective had a totem pole, carved by people who attended the gatherings, a colourful banner representing different aspects of the collective and a large carnival style Green Dragon -representing the Earth as a living being. “May the Long Time Sunshine Fall Upon You, All Love Surround You, And the Pure Light Within You Guide You All The Way On". The jug became known as the ‘Green Grail'. The Sunflower symbol of the Greens had been brought, both metaphorically and in reality, from Germany to England. When Petra died, on October 1st 1992, collective members took the grail up to the German Embassy in Belgrave Square, London for a moving ceremony with embassy officials. The second Ecology Party Summer Gathering included a specific invitation to the whole ecology movement to come together, and the idea evolved further in 1982 when the invitation was extended to the green movement, seen as much broader than the ecology movement and defined by the collective as those supporting seven principles - ecology, feminism, peace, liberty & democracy, justice, co-operation and, interestingly, personal development - as laid out in a leaflet at the time. The slogan 'The Greens Are Gathering' was coined to describe the coalition-building process the collective was facilitating. At the 1982 gathering itself a lengthier Green Declaration was written and discussed by the many groups that were there. It was an attempt to describe a common philosophical basis which the wider green movement could support. As part of this effort a series of articles were published in magazines like Undercurrents, Peace News and Green Line. It appeared there was considerable support for a coming together of grassroots groups from these different social movements. The gatherings inspired the creation of political groups, such as Green CND, small businesses, community campaigns and individual initiatives. One that would have pleased PEOPLE's founders was the creation of SDP (Social Democratic Party) Greens by collective member Mike Bell. The collective was the first organisation in the UK to use the word 'Green', in 1982, to describe the new political movement that was emerging. Greenpeace was, of course, already using it but with a more limited 'environmental' meaning. For the collective the label 'Green' described a movement that encompassed and politically linked the separate single issue social movements (feminism, ecology, nonviolence, social justice etc) that were powering change. It also differentiated them from the Ecology Party, seen as more limited in terms of both strategy and philosophical underpinning. Die Grünen – the Greens - in Germany were already pioneering the social movements’ model. In bringing the label ‘green’ and the sunflower symbol to the UK, the collective was inspired by, and following, what was happening in Germany. To promote use of the sunflower symbol, the collective set up a small trading company called Sunflowers, run by Anne Waterhouse, to sell sunflower emblazoned 'Greens Are Gathering' T-shirts, badges and stickers. The plan to differentiate themselves from the Ecology Party did not, however, work too well, as the party followed suit and changed its own name to 'Green' three years later. The party also adopted the sunflower symbol, during the 1983 general election campaign. It was, however, only formally adopted after the name change to ‘Green’ in 1985. It eventually evolved into the world with petals logo. Even though many collective supporters were members of the Ecology Party they maintained an ambivalent attitude towards the party, which they saw as too conventionally 'party political' and centralist in its approach. Many would have preferred the locally autonomous approach pioneered by the Oxford Ecology Movement and some were inspired to set up independent green groups, such as the South Devon Green Collective and the Huntingdon Greens. In April 1984 an article in Peace News said there were thirty-five such groups, including in Bradford, Swansea, Sheffield, Cambridge, Huddersfield and Canterbury. Efforts to strengthen the movement of independent green groups and candidates were supported through the organisation of a Green Network Gathering in March 1986 in Glastonbury. But the event didn't produce the kind of forward momentum organisers had hoped for. Closely allied to plans for independent green groups were plans for local green gatherings and fairs. There was a strong sense that it would be better to create small, community-focussed local gatherings than to make the main gathering larger and larger. The estimated attendance at the main 1983 gathering was 20,000 and that was felt to be quite large enough. To help those planning smaller gatherings the collective produced a Green Gathering Advice Pack and launched the Green Roadshow, an assemblage of buses, trucks, entertainers, kids equipment etc that could provide a core to any event and travelled the country during the summer months. It was co-ordinated by Richie Cotterill. One good example of such an event was the Boscombe Down Gathering at RAF Boscombe Down organised in protest at the USAF F-111 nuclear bombers periodically housed there. Each bomber could carry six 200 kiloton missiles, and each one of them was at least ten times as powerful as the bomb which destroyed Hiroshima. The organiser, Terry Wynn, described the Advice Pack as “very informative” and this was just one example of the way the Collective seeded other distributed localised activities. Sally Howell still takes part of the Roadshow out, often with Andy Hope. It can be found at Glastonbury Festival in the Green Fields area every summer. Engagement with the peace movement, seen as a strategic priority, first took concrete form when Ecology Party CND (later Green CND) was formed at the 1981 gathering. The next year some members of the collective set about planning a gathering at USAF Greenham Common, the first intended destination for American nuclear-armed Cruise missiles. This event began on July 4th 1982. The Greenham Green Gathering, which then became the Greenham Festival and, finally, the Counter Cruise Cosmic Carnival was radically transformed by the arrival of a 'Peace Convoy' from Stonehenge, making it a much larger and more controversial event. The convoy remained on site at Greenham's Green Gate, for three weeks, before leaving. Two years after that the collective again took direct action by organising, together with Green CND and Wheat to the Starving, the 1984 Green Gathering at RAF Molesworth, opening a second front in the campaign against US Cruise missiles. The following summer, in Reykavik, presidents Gorbachev and Reagan, of the USSR and the USA, made the deal that led to the abandonment of Cruise deployment. Popular opposition in Europe was later cited as a reason. 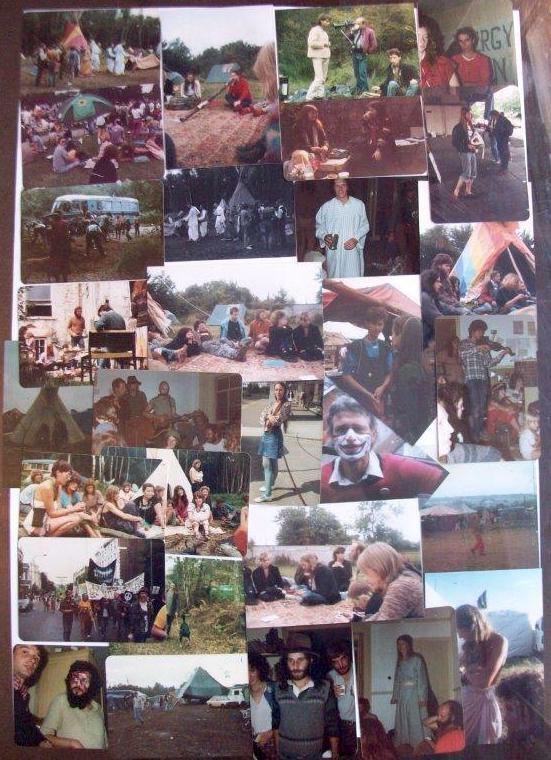 The last legal gathering organised by the collective was the 1983 Green Gathering at Lamberts Hill Farm, in Pilton near Glastonbury. The location had changed at the request of Michael Eavis, owner of the Worthy Farm site that the gathering had used for the previous three years. The gathering was growing in size and Michael thought hosting both the green gathering and the Glastonbury Festival was too much for one farm. Teddy Stone, owner of the new site, was a good friend of Michael's and happy for his land to be used for what was billed as a child-centred event, with the site plan laid out around a central kids area. The event, however, was caught in controversy with the arrival of a 'free festival' convoy from Inglestone Common in Gloucestershire, a police road block and an outbreak of 'green gut', a virulent stomach bug possibly brought by the convoy who'd had their previous site sprayed with manure by locals. Thus it was that 1984 saw not only a squatted free Green Gathering at Molesworth but also a Green Field, organised at first by Bruce Garrard, then in later years by Kim McGavin, Anne Waterhouse and Liz Eliot. Within a few years that one field had grown to almost a quarter of the entire site (including allied groups), and was celebrated as the most peaceful and enjoyable part of the whole festival, as well as being the only area that was litter-free, in stark contrast to the main stage arenas. Although now (2018) absorbed within the main festival's organisational structure the Green Fields remain a very popular part of Glastonbury Festival. But it left the Green Collective with a headache; no site for its main event, the Green Gathering, the annual gathering of the tribe. Despite many searches, and many rejections (often the result of concern about ‘new-age travellers’) only one site was found, in Suffolk, where a local Earl had offered his land for what was intended to be a European Green Gathering in 1986. The group had started work on the proposed European gathering; the site was agreed, a limited company had been created to run the event, letterheads and back office preparation was starting, international contacts had been made and the team to run the event on the ground was being recruited. Disagreement, however, over how to deal with new age travellers who refused to pay or contribute, and whether they should be allowed in, triggered anxiety within the collective. But these issues never really came to a head. The Earl withdrew his invitation on advice from the police who warned him of issues with 'the convoy'. In an effort to resolve this perennial issue the collective had already set up a Land Fund to buy a permanent site; but it never raised much money. In the end, when the collective was wound down, the money was invested in shares in the Glastonbury Assembly Rooms, which still goes strong. Glastonbury had been the spiritual home of the collective and the Assembly Rooms the venue for the Green Network Gathering. But this certainly wasn't the end of collective related activities. In 1987, inspired by the Green Network Gathering, Richard Oldfield began publishing Green Options, a magazine that pursued a confederalist, non-party political approach to building the green movement. The four issues published are available in the Library here. 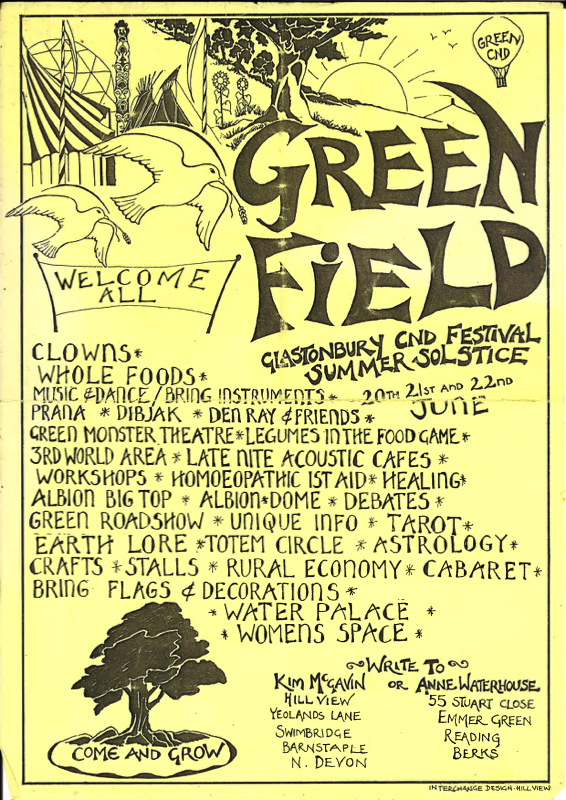 In 1989, under the Green Collective banner, a new area within the Glastonbury Green Fields was created, the Green Futures Forum (GFF), to provide speakers and debate on a wide range of political subjects. The press release (click on image to the left) was the final act branded "Green Collective". The GFF itself is still going strong - Richard Oldfield was responsible for organising the first one, since then it has hosted many top speakers including Tony Benn, John Sauven and Michael Eavis himself. In 1990 the Green Litter Crew was created as a fundraising project -with 1800 volunteers at its peak- to clear the site of litter during the festival. It organised early morning picks, litter blitzes between stage acts, an educational 'Green Police' theatre group, stall monitors, immediate post-festival picks and local green parties to pick the lanes around the site. The Green Litter Crew introduced a substantial amount of re-cycling and raised £30,000 for the national Green Party in its first year alone. Meanwhile the Green Roadshow, under the care of Richie Cotterill and Celia Kibblewhite, had sprouted an offshoot, the Travellers Skool, to provide support and resources for the many out of school children at 'new age' traveller sites around the country. It registered itself as a charity and continued its important work for many years. Any retrospective assessment of the Green Collective, thirty years after its demise, would have to conclude that it achieved a lot with very little. And many of its initiatives have stood the test of time. The main green gathering returned, first as the Big Green Gathering and then in its third incarnation, once again called the Green Gathering, and still going strong. The Green Fields continue providing a showcase of new thinking for the hundreds of thousands who visit Glastonbury Festival. But the central purpose of the collective, the construction of a politically effective green movement, hasn't happened. But nor has it happened for the Green Party.